There are plenty of average statistics that help us identify trends. The average height for women in the U.S. is 5 feet 4 inches. The average American lives to the ripe old age of 78.74 years. The average four-year-old asks 437 questions a day — OK, that's actually a myth. However, spend an afternoon with a pint-size philosopher, and that myth may be more accurate than we think. 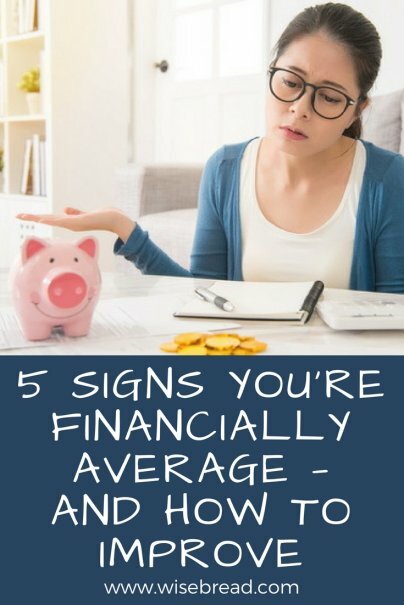 When it comes to personal finances, aiming for average is a trend you want to avoid in most cases. Data from the 2014 U.S. Census lists the average American salary at just north of $70,000. But the average American is living close to the edge, financially speaking. The average household debt is $132,000. The average new car loan term is 65 months. The average person between ages 55 and 64 only has around $104,000 put away for retirement. And the average American doesn't have $500 in a savings account to cover emergencies. If you're living from paycheck to paycheck, unable to pay your credit card balances in full each month, or neglecting your retirement savings, chances are you're an average American. Here are a few things to focus on in order to relocate to the land of better-than-average. Improving your savings rate is difficult when living up to or beyond your income levels is buffered by debt. Continually taking on additional payments can make it very difficult to redirect disposable cash to meet savings goals. Eliminating debt carried month-to-month on credit cards, student loans, or auto loans will free up money, save on interest and late fees, and remove the added stress of managing those bills every month. You might not be able to save 60 percent of your income, like the blogger behind DistilledDollar.com did, starting tomorrow. Actually, Matt's ability to save evolved over the past three years. "We started out saving just 10 percent of our income," he says. By looking at ways to cut back on simple expenses like his dry cleaning or making meals at home, Matt was able to make adjustments that added up. Moving to a smaller apartment within walking distance from his job allowed him to cut his overhead and ditch the need for a car. Fewer expenses means Matt keeps more of his hard-earned cash. Losing money is not on the average person's to-do list. So, I understand why many Americans tread lightly here. But learning to invest your money is a must if you want to break out of the average doldrums of financial life. Hilary Hendershott, certified financial planner and host of The Profit Boss podcast, says that most people do not max out their 401(k) retirement accounts. "Start there. You can save $18,500 a year if you're under 50," she says. Beyond maximizing the benefits of your tax-deferred investment options, dipping your toe into the world of investing may start with interviewing financial advisers to help you navigate these new waters. Seek out independent advisers who are fiduciaries — this just means they will advise you based on your best interests. When we're living beyond our means using debt to prop up an inflated lifestyle, a lack of contentment may be the issue. A 2016 Harris Poll identified what they called the American Happiness Index to be 31 out of a scale of 100. That number is down slightly, but hovers in the low 30s pretty consistently, year to year. Appreciating what you have until you can save and pay cash for its replacement will help you avoid living financially overextended and being unhappy like so many of your neighbors. Speaking of those around you, Jim Rohn famously quipped, "You're the average of the five people you spend most of your time with." Rohn, a motivational speaker and successful businessman, was likely leaning on the law of averages to back up his claim. That is, the outcome in any situation will be the average of all potential outcomes. If the theory is correct, to improve financially, start hanging with other people who are fiscally responsible. Think about it. If your girlfriends are known for planning last-minute getaways and you have a penchant for plastic, these trips can contribute to financial instability. If your family places a premium on material items without regard for the ability to pay, you might be absorbed into that overspending way of life.